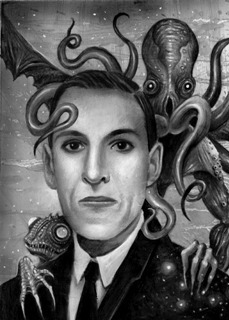 Neurotic, prejudiced and dependent, Lovecraft's alleged weaknesses in his dealings with real people seemingly facilitated the creation of a fantasy world in his mind which he drew upon to build an extensive and unified cosmology known as the Cthulhu Mythos. In our modern times, where authors themselves have to step into the media limelight, Lovecraft would have been a publicity disaster. But, luckily for him, in his own time his literature spoke for itself - although one can hardly rate his publishing and sales record between the world wars as particularly successful. It was after his death that his legacy steadily grew - his Mythos providing the blueprint for other genre authors to add their own novels and short stories. One has to wonder whether the need to project authors into the limelight for public scrutiny these days might inhibit the recognition of socially dysfunctional writers whose fantastic work is their creative outlet. Attendees of comic conventions might smile wryly. 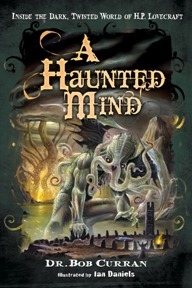 Curran's biographical analysis aside (which has produced some sharp criticism on-line from Lovecraft fans), the bulk of 'A Haunted Mind' is turned over to the content of his work. Curran presents the extensive bibliography of Lovecraftian tomes, the pantheon of barely pronounceable Lovecraftian deities and the gothic settings of Lovecraftian realms in great detail. Each step along the way he examines the possible influences which Lovecraft drew from. This gives Curran the opportunity to explore obscure and esoteric topics, as well as embarking upon his trademark story-telling. For instance, he presents a potted history of magical and occult texts from Europe and beyond, drawing analogies with Lovecraft's own invented tomes, like the Necronomicon. Some of Lovecraft's fans wonder whether such a tome may really have existed, a Rhode Island copy of which was accessed by the horror writer himself. Such notions seem somewhat fanciful. I must admit, as someone who knows little of this genre I became quite confused at times. I found it difficult to know when Curran was describing a real-life mediaeval scholar exploring the esoteric literature, compared to one of Lovecraft's own historically-based characters used to flesh out the history of his fantastical tomes. This was not helped by the fact that Lovecraft's milieus contain real-life locations and universities alongside fictional institutions. When was a scholar based at the British Library real or fictitious? Sometimes, I just could not tell. In his books, Bob Curran often leaves open the prospect of a reality underlying the horror genre, tantalising the reader at the end of each chapter with a throw-away remark. Yet, paradoxically, when dealing with evidence-based subject matter he is entirely dismissive. Certainly, Curran's handle on horror is better than it is on astronomy, as his relayed critique of Planet X demonstrates (p130). But his review of the fictional Mythos contains mention of an unknown race of beings who "ultimately inhabited a dark planet just outside the solar system..." (p205) and the 'Dark Star' in the constellation Taurus (pp 90, 125-6, 237), both of which will interest my Dark Star Theory readers. As a ghost hunter in this part of the world, my interest in this aspect of the Mythos was piqued. I imagine that readers living along the North East seaboard of the U.S. would be similarly intrigued by Curran's many descriptions of spooky, decaying towns in that part of the world. Gloucester once again crops up, this time the Massachusetts version with its 'poor cousin' settlement of Dogtown influencing Lovecraft's Innsmouth. Curran also suggests East Haddam as a place that Lovecraft based Dunwich upon. Local knowledge of places and folklore influencing fictional work make a book like this come to life, and ghost-hunting in these areas would surely be great fun when bearing in mind the monstrous entities of Lovecraft's world! Batman's Arkham Asylum aside, I'm surprised that Lovecraft's work has not influenced more movie-makers or video game programmers. Surely his Mythos provides ample source material for some fantastic games and movies, in the same way that it has influenced so many other novelists? Bob Curran's detailed examination of this horror writer's magnum opus provides a comprehensive resource for anyone exploring his fictional Cthulhu Mythos, even if his biographical analysis will not exactly delight Lovecraft fans. Subtitled: "Inside the Dark, Twisted World of H. P. Lovecraft"